Heat oven to 200C /180C fan /gas 6. Heat half the oil in a large non-stick pan and fry mushrooms on a high heat for about 5 minutes until golden. Add the garlic and fry for a further minute,then tip in the stock and sweet potatoes.Bubble for a few minutes until reduced. Season,then remove from the heat,stir in creme fraiche,spinach and kale. 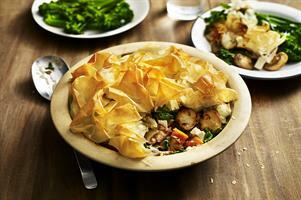 Pour into a pie dish and top with the cubed feta.Allow to cool for a few minutes. Brush each sheet of filo with the remaining oil,quarter the sheets then loosely scrunch up and lay on top of pie filling. Bake in the pre-heated oven for 20-25 minutes until golden. Serve with extra green vegetables like steamed broccoli and green beans.